When I heard the news about her heart attack I began to grieve but hoped & prayed for the best outcome. Carrie Fisher was one of the most brilliant minds of our generation. Yes she was known for her 'Star Wars' iconic role as Princess Leia but she was so much more. Her brutal honesty is what impressed me. I caught her theatrical performance of “Wishful Drinking” a few years ago at the Huntington Theatre in Boston twice. The first time the electricity went out but she continued to perform with candles until she just had to admit it wasn’t going to work for that night but in the meantime it was like experiencing an intimate moment with her. When we returned a few nights later for our rain-check or electricity-check she was brilliant. 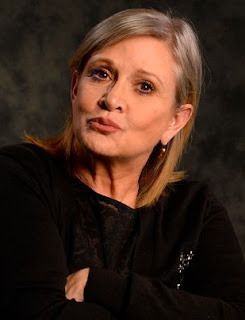 There are few performers who when you see they are going to be on a talk show you know not to miss their appearance & Carrie Fisher was high on that list. I remember in the 1980’s I sat in back of Carrie when she was with Paul Simon attending a movie on the Upper West Side in NYC. I can’t remember what the movie was but I do remember I had no problem watching the movie over their petit sizes & they were so refreshingly real with each other. Our hearts & thoughts go out to her family. Another fabulous person we have lost in this painful, awful year.